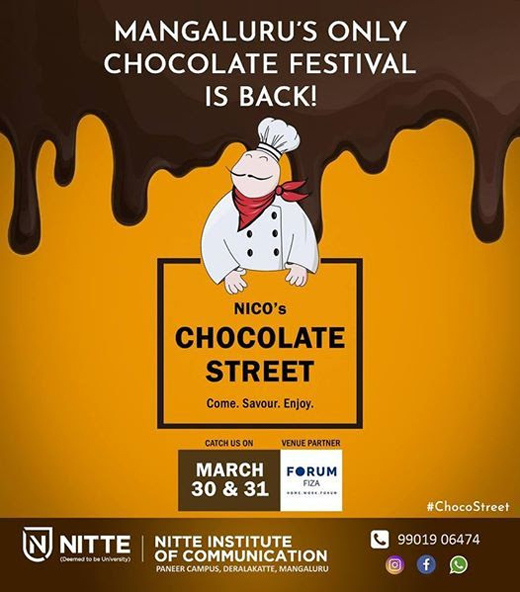 Mangaluru, Mar 29, 2019: Nitte Institute of Communication will organise its second edition of chocolate festival for two days at Forum Fiza Mall here from March 30. The items include homemade chocolates, pastries, cupcakes, cookies, shakes, and even chocolate based lip-balms and moisturisers. Chef Thirugnanasambantham K., Principal of Welcomegroup Graduate School of Hotel Administration, will inaugurate the festival on March 30 at 11 a.m.
Manish B., a junior chef at Lalit Bekal, will conduct a masterclass on baking chocolate delicacies on March 31 at 4 p.m at the atrium in the mall. There will be free entry for the festival, a release from the institute said.